Students as young as three years old are being suspended or expelled from schools across the U.S. This phenomenon is part of a broader national trend of increased reliance on harsh, exclusionary discipline for minor student behavior issues. Secretary of Education Arne Duncan recently stated that there is a distinct positive correlation between out of school suspension and juvenile detention. 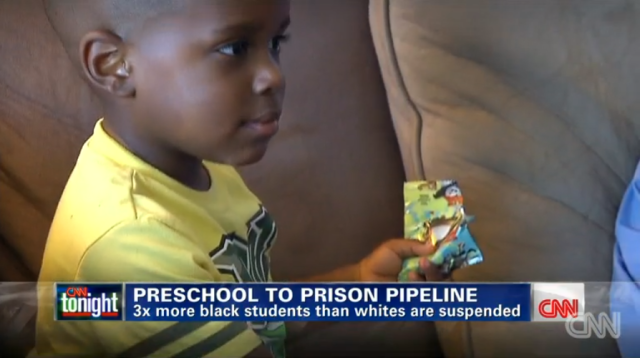 The school-to-prison pipeline is not only real but, as a CNN report shows, is increasingly starting at a pre-k level. The U.S. Department of Education reports that 7,500 children nationwide have been suspended at least once from public preschools in 2013-14. And black students are suspended or expelled three times more frequently than white students – a startling fact, but hardly surprising given the well-documented racial disparities that pervade school discipline. The ACLU of California is sponsoring AB 420 (Dickinson), a bill that would combat this trend by limiting suspensions and expulsions for so-called “willful defiance” - one of the 24 different grounds for suspending or expelling a student authorized by California law. Under this subjective offense, students have been suspended multiple days for the most minor issues like not bringing a notebook to class or talking in class. AB 420 would eliminate expulsions for “willful defiance” and limit suspensions in early grades. California has the opportunity to become a national leader in combating this trend of pushing students out of school at increasingly younger ages. David Sapp is director of education advocacy/legal counsel at the ACLU of Southern California.